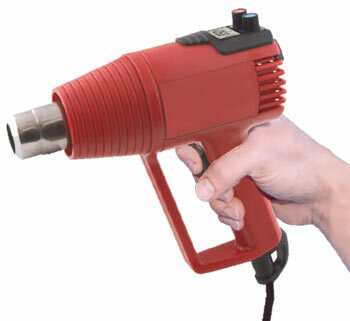 Rugged, ergonomic heat guns with digital display of temperature and air flow. Adjustable heat in 10° increments from 50 to 540°C (130 to 1000°F), and adjustable air flow from 4 to 16 CFM provides fast, reliable, repeatable flameless heat. Value added features include lockable temperature and air flow controls, power interrupt safety reset, Fahrenheit or Celsius and balanced ergonomic design. Programmable or dial-in settings. (See below for list of pre-programmed, dial-in settings.) Powerful, accurate, controllable heat and air flow to get the job done right. Electronic temperature control system maintains constant temperature when varying air flow or using attachments. A broad range of optional attachments make the LCD Heat Guns ideal for a wide variety of applications including heating, shrinking, drying, soldering, desoldering, plastic welding and more.